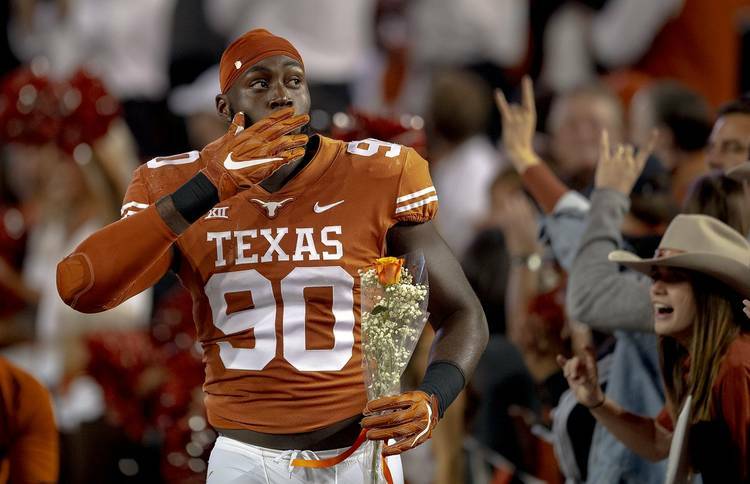 Texas defensive end Charles Omenihu has said numerous times he returned for his senior season because he “left some plays out there.” He must’ve gotten a bunch of them in 2018. Omenihu was named the Big 12’s defensive lineman of the year when the league announced its annual awards on Wednesday. League awards are voted on solely by Big 12 coaches. It’s the second straight season a UT player has won this honor, which is a testament to defensive line coach Oscar Giles. Last season, Poona Ford was named the league’s best defensive lineman. Brian Orakpo also won it in 2008. “What a blessing God has blessed me so much in such a short period of time all praise to the most high,” Omenihu tweeted shortly after the announcement. He ranks fourth in the Big 12 this season with 14.5 tackles for loss and second with 8.5 sacks. Safety Caden Sterns, nicknamed “The Wolf of DKR” in the locker room, earned the title of defensive freshman of the year. It’s the seventh time a Longhorn has captured that honor. Sterns has started 12 games this season, the most by a freshman defensive back since Blake Gideon started 13 in 2008. He’s tied for fourth on the team with 59 tackles. Omenihu, Sterns, cornerback Kris Boyd and tight end Andrew Beck were all named first-team All-Big 12. Boyd has 57 tackles and 15 pass break-ups. Beck is enjoying a career year with 26 catches for 256 yards and two touchdowns. Center Zach Shackelford, kicker Cameron Dicker and linebacker Gary Johnson were second-team All-Big 12 selections. Oklahoma quarterback Kyler Murray was named the Big 12’s offensive player of the year while West Virginia linebacker David Long Jr. captured the defensive honors.